This is sort of a reboot of the original RPG_NET Alpha below but more focused on the server side UDP web services/core. (At least as of right now) The server application keeps track of all users that join the game as well as all their statuses. There are mutliple configurable "worker" threads that run and do things like update the registered clients, take in information from clients, handle chat and server notifications and do clean up of users who have disconnected. There is also a client application that can connect to the server. As of right now, the client application can register with a username and join a game. Once in the game, all active users can be seen on the console window and are updated as they move around. Basic chat and notifications are also there. Server application requires SDL_Net 1.2 and client application requires ncurses library. Currently written in linux so I've been using g++ 5.4.0 to compile the makefile. Link to GitHub project below. Release Date: TBA, last update 9/26/18. 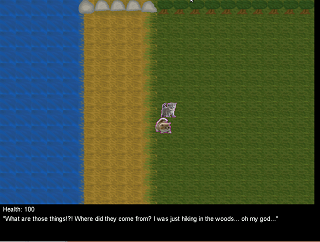 Note: Screenshot above shows temp cat sprites in latest reboot. Release Date: Canceled and replaced by Java version (in java projects page), C++ version last update 10/21/17. Demo: v1 Basic Engine Demo available at the C++ files section (From ~2004). Link to latest v2 versions above. This was a project I'm was working on with a couple of other students in college. The code here is what I was working on which was the networking backend behind the program but I also dug into the graphics engine a little bit. The name of this project supposed to be completely temporary, I just made that up so I had something to call my folders. The screen shot above is a taken from the really basic graphics engine I threw together on 4/3/06. I had used the same player image as the one from the now defunct Millennium Crisis (just shrunk down a lot). Well, the project was going to be a multiplayer rpg where you can play with friends and such. It was supposed to be really simple, we're were just doing this project mostly for a learning experience. Unfortunately it was never finished. Release Date: Canceled but sources released in link above. This is a file editor that you can edit files and run a console for easy compilation and program/script editing. I'm thinking about making it a multi-file editor for even more ease to use. The current screen shot is of 12-1-05 and it's showing the file editor working, the console path working, and an xterm open (an external console program). I'm not going to have an imbedded console program b/c all operating systems come with one and you can just use that one.